The Center for Emerging & Innovative Sciences (CEIS) has announced SimPore and Micropen Technologies as the winners of the 2013-2014 Short Term Applied Research (STAR) program. The STAR program focuses on New York State small businesses to address and solve time critical science and business problems. SimPore is a Rochester, N.Y. based nanotechnology company co-founded by James McGrath, Associate Professor of Biomedical Engineering and Graduate Program Director of Biomedical Engineering at the University of Rochester. SimPore designs and produces membranes and membrane-enabled products based on its unique patent-pending platform technology: the NanoBarrier™ ultrathin nanoporous silicon membrane. The NanoBarrier™ membrane is the world's first membrane to offer both tunable nanometer-scale thickness and pore size. SiMPore is developing products that take advantage of these one-of-a-kind features, including filters for separating and concentrating biological molecules and nanoparticles, cell culture substrates for growing cells, and electron microscopy grids for preparing and imaging samples at the nanoscale. For more information please visit SimPore. Micropen Technologies is a design, development, and manufacturing resource and partner to electronics companies and medical device companies in the specialized technology of applying functional materials to surfaces. 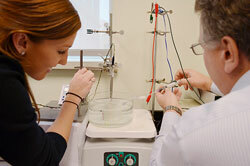 Micropen Technologies has collaborated with the University of Rochester for more than a year on medical balloons with ablation electrodes and temperature sensors that can precisely apply energy to deactivate or destroy targeted nerves. In particular, denervation of renal nerves holds great promise in treating patients with drug-resistant hypertension. The work started as a Senior Design Project in the Biomedical Engineering Department and has continued at the Center for Medical Technology & Innovation. The goal is to develop a universal printed balloon solution for denervation therapies applied anywhere in the body. For more information please visit Micropen Technologies.